Music groups, singing and fun for babies, toddlers and pre-school children with their parents and carers in Canterbury, Whitstable, Faversham and Sittingbourne! We are Kirsty Ottaway and Sara Holman. As mums of young children ourselves, we have been taking them to Musical Bumps classes for a number of years. We saw how much our children loved it, and the power of learning through music. We soon decided that we wanted to start our own Musical Bumps classes, and are extremely excited to be bringing them to Canterbury, Faversham and Whitstable. I previously worked as a teacher and music coordinator at a primary school in Ashford. I have been involved in music from a young age, learning to play the violin and viola, and later undertaking a degree in music. I am a keen lover of music, and learnt to play the violin at school. I am also a member of the local choir and have worked as a teaching assistant at a local primary school. I have been singing from a very young age! From classical to musical theatre in my teens to signing professionally in various bands for the past ten years. I took my daughter to Musical Bumps classes before she went off to school. Now I have more time on my hands I thought what better way to spend it than to work with Sara and Kirsty delivering sessions of my own! You can phone us on 07934 921072/3 or complete this form to book your free trial class. GDPR compliance form. To ensure that we comply with new regulations, all current and newly registering customers need to complete this form. We have paper copies of these at class too. (Please note that we do not require this form to arrange a free trial class for you!). 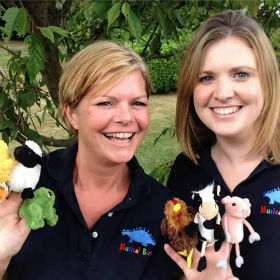 Musical Bumps Canterbury, Faversham, Whitstable and Ashford can create a bespoke programme of learning for your school or nursery’s specific needs. From one-off workshops or parties, clubs and choirs right through to a full music curriculum for EYFS and KS1, you can rely on Musical Bumps to provide stimulating, ambitious, practical and musical classes and clubs! Keep up to date with all our news on Facebook and Instagram! It is our aim to respond to new class enquiries as quickly as we can – certainly within 24 hours. We are experiencing issues with some of our response emails going to spam so please do check. Stagecoach buses operate a bus route from Ashford to Canterbury that stops right outside Big Fun House. For timetable information please go to the Stagecoach site. Macknade is found on the corner of the A2 and the Selling Road opposite the Shell garage. Classes are held in the upstairs room through the café. Don’t forget to stop there afterwards as every adult receives a free regular coffee or tea.